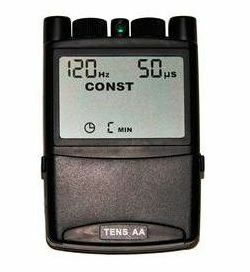 The TENS AA by TENS Pros is an extra special digital TENS device because it only uses AA batteries, which are included free. 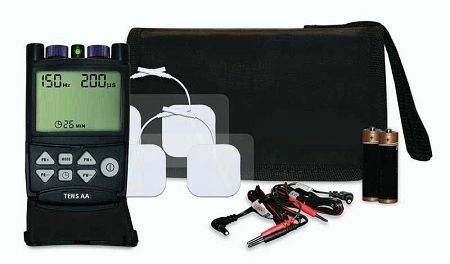 This TENS unit has 5 treatment modes and a large LCD screen, which makes it so easy to see. This unit has a recall program and is easy for anyone to use. Simply a great digital unit with a variety of programs at a great price. Comes with a pack of 4 electrodes, batteries, lead wire set, and instruction manual, all in a nice hardy carrying case. Easy to set up and adjust on the fly without having to turn off stimulation makes this AA powered unit easy to fine tune for maximum pain relief. Many other units have to be shut off to change frequency or pulse width then restarted to see if the new setting works better or not. This unit allows one to adjust during the treatment session to obtain maximum relief with minimum discomfort or overstimulation. Havent gone over 20% - 25% intensity to get great pain relief...so it's plenty powerful and batteries have lasted through 5 days, 3 sessions per day and still going strong. Powerful and just as good as what I get when I go to chiropractor! So powerful for the size. I am in constant pain with neuropathy in my neck and nothing worked until I tried this unit. Now I have NO PAIN! I LOVE IT! It is straight forward to use. Neck pain, my problem is occurring less frequently. It does not always stop the pain, but it always helps. That is more than I can say for pain pills. I am glad I bought it. Had this product before- LOVED it so much that I purchased another! Thank you guys for this much needed and compact Tens Unit and its accessories. This portable little guy does just what I need without going to a Physical Therapist and being hooked-up and lying around for a short time relief. It worked but wears off before I get home in most cases. That's beauty of having this little life saver handy. Thanks again people and we do have a future together. Q: LG-7000 does this operate only on batteries? 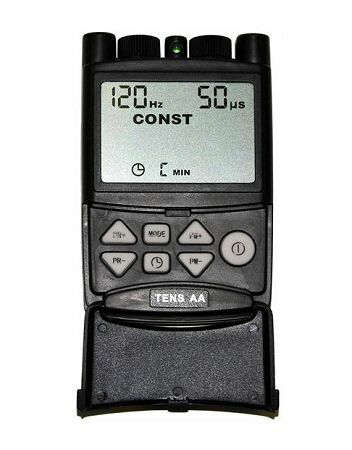 Yes, the TENS AA operates only on AA batteries.